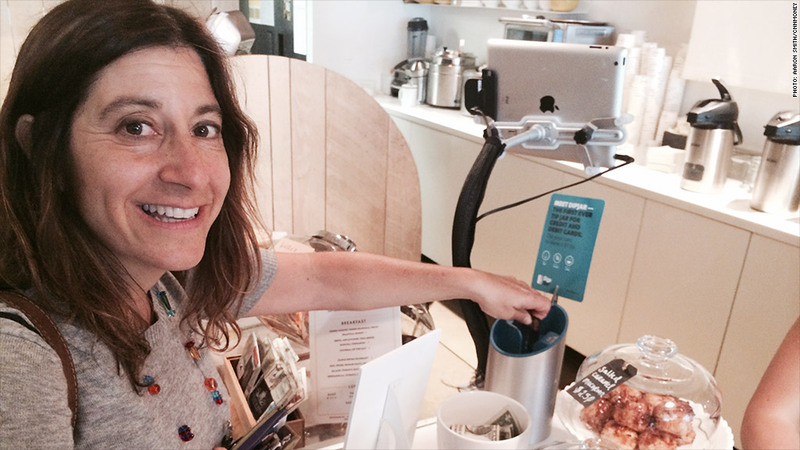 Susye Greenwood, a customer at New York's Fresco, tips $1 for her server via a swipe of her card in the DipJar. The tip jar at coffee shops is often an embarrassment for the kind of people who pay for everything with their credit cards and rarely have small change on hand. The electronic DipJar, a device that accepts credit and debit cards for $1 tips, is here to help the cashless. DipJar, a startup based in New York and Boston, has been testing the devices at 20 locations in New York over the last two years. It is now ready to expand into as many as 200 locations after a cash infusion from investors of $420,000. "We intended to do a short trial, but once they were on the countertops the stores didn't want to give them back," said DipJar co-founder and CEO Ryder Kessler. At Fresco Gelateria, a New York coffee shop, it means an extra $15 to $20 a week for barista Samantha Kulch. So far, the cash tip jar still brings in much more -- $15 to $20 per day -- for her. "People definitely use the cash jar more," she said. "People marvel at the DipJar more than they use it." For Ilias Iliopoulos, co-owner of Fresco, it's a time saver. The company does the task of divvying up tips among the workers, saving him about an hour's worth of work every week. Iliopoulos said he's had the DipJar for a year and it brings in $150 to $200 per month. He said that DipJar skims 6% off the tips. Related: Who are the best tippers? Iliopoulos said there's one glitch the company should work out: the DipJar doesn't make a sound when customers dip their card, so they can't tell whether the transactions went through. Susye Greenwood, a photographer, discovered this when she used the DipJar during a recent visit to Fresco. "I wasn't clear on whether it worked," she said, wondering whether she should dip her card a second time. But Kessler insisted that the DipJar does, in fact, make a noise. "It's just hard to hear amongst the ambient sounds of coffee grinding, music, air conditioning and chatter," he said. "That's a big flaw that we're fixing: amping up the change-clinking configuration in the next unit." The new models, will also feature lights that will go off to confirm that a transaction went through.